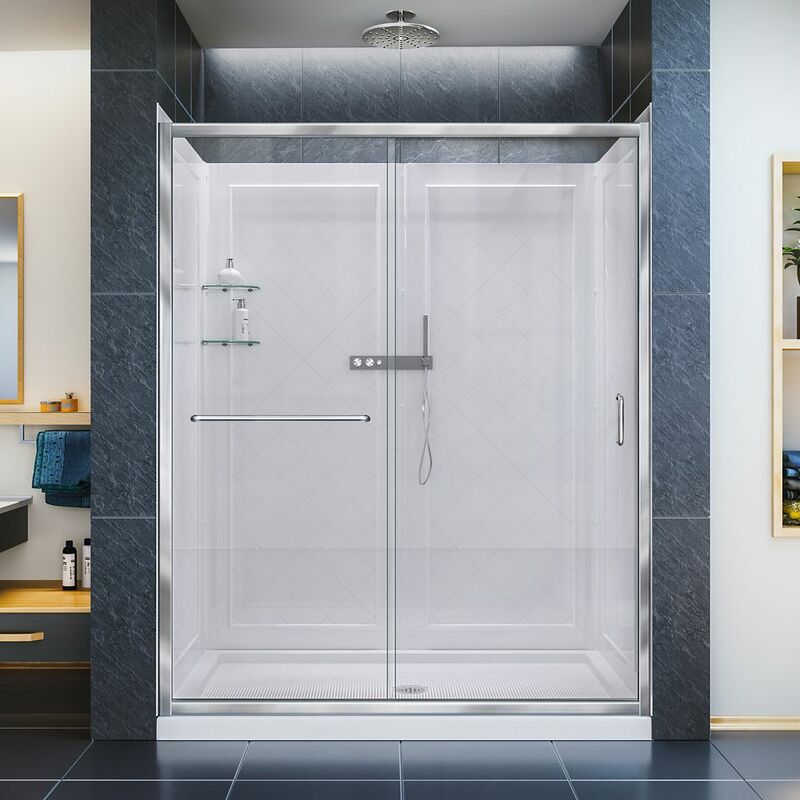 Infinity-Z 36-inch x 60-inch x 76.75-inch Framed Sliding Shower Door in Chrome with Center Drain Base and Back Walls Kit The DreamLine Infinity-Z sliding shower or tub door offers classic style with a modern touch. The Infinity-Z will transform your bathroom with a beautiful balance of functionality, elegance and sophistication. A variety of finishes and glass options will match any bathroom decor. The included SlimLine shower base completes the look with a low profile design for a sleek modern look. The base has a glossy acrylic finish that is scratch, slip, and stain resistant for safe showering and is reinforced with fiberglass for durability. Plumbing codes vary by state, DreamLine is not responsible for code compliance. Drain opening fits any standard 2 in. compression fitted drain (Drain not included). The Qwall Backwall features an attractive tile pattern for a modern, trendy look and 2 glass shelves for storage. Shower Door and SlimLine Base: Limited Lifetime Warranty (Oil Rubbed Bronze finish limited to 1 year warranty); Backwalls: Limited 1 Year Warranty. Professional installation recommended. Infinity-Z 36-inch x 60-inch x 76.75-inch Framed Sliding Shower Door in Chrome with Center Drain Base and Back Walls Kit is rated 4.0 out of 5 by 1. Rated 4 out of 5 by SMB from Installed in master bathroom of our vacation cabin. Pros: very nice looking, fairly easy to in... Installed in master bathroom of our vacation cabin. Pros: very nice looking, fairly easy to install, shower doors are very nice and smooth gliding, overall a nice looking, functional shower. Cons: shelves not very usable, walls not as solid as would have liked (some flexing in some areas if pressed on (between studs)). Would still recommend but deducted 1 star because of walls being thin and not being as solid once installed. Overall a good value and very nice looking.